This bear is about cross-stitch, knitting, crochet, and a few other crafts. Effy Wild is doing a month of blogging. I always mean to blog more, but don’t. Usually, I try to come up with blog posts that I think will be “interesting” instead of being my real, authentic self. I feel like I am trying to put a glossy magazine image of my life together, and, honestly, my life is not like that. But that doesn’t mean my life isn’t worth blogging about. So, I am going to try to follow along. There might not be beautiful pictures every day. Things might even get dreary once in a while. But, since I think the only person who even reads this blog is my sister (Hi, sis!) I’m just going to put whatever I come up with that day on the blog. We’ll see how it goes. And just after I wrote that, I read about Effy and the “Always Be Magical and Awesome.” Hehe. I feel like I’m having a conversation with you, Effy. I was reading on Effy’s blog about how no one would want to photographer her studio for “Where Women Create.” I love that magazine, and I love most of Stampington’s lineup. But there is a certain sameness to every issue I find a bit irritating. Effy’s studio is actually the one I want to see. I don’t want to see perfect clear spaces, all the paints in a box, the brushes pristine and in a gilded antique. I want to see teaming piles of papers and books about to topple over. I want to see a desk two feet deep in supplies and detritus. I want to see beautiful chairs you can’t even get a good look at because the artist has done what I always do: put all the crap that’s too delicate, valuable or inconvenient to just put on the floor. And then I want to see their cat perched on top of it anyway, like my cat does. I work at my art journaling very slowly, so it may be another few years before I can say this Halloween journal is complete. But I do enjoy working with it very much. One of the best things about October is the chance to get away on the weekends. James' job keeps him tied to the office through just about all of September, so we like to really use these lovely weekends to do day trips. And we couldn't have asked for better weather than this weekend. It didn't quite get to 80 degrees, as they were forecasting, but it was lovely and warm and we drove through the Connecticut countryside with our windows rolled down, and the breeze rolling in off the mellowing fields. I actually took the above photo from the car, while James was driving, so I'm quite pleased that it turned out as well as it did. You can see its too early for color yet, but its coming. This morning I'm having my coffee in my other Halloween cup. This is a very special morning, because East Cambridge Business Association is having Rib Fest, right here on Cambridge Street. And we live literally right in the middle of it! The whole house smells like barbeque. I have my tickets, and when the festivities begin at noon, I'm going down and nom, nom, nom. I could hear them starting to set up when I woke up this morning, with the police setting up traffic barriers, and the restaurants preparing their booths. Pumpkin and other spice-filled scented candles are a lot of fun, and really get me in the mood to enjoy the overcast days and cool breezes. Maybe in a day or two, I can share my stash of candles with you. I've noticed that the florists, farm stands and craft stores have started putting out pumpkin displays -- though the latter are usually made of of fake pumpkins. I still don't have a front porch to put a Jack-o-lantern on, so I will have to continue the tradition of admiring the displays at the Pumpkin Festival in Keene. We've gone so many years now, only missing occasionally. We even go in the rain, though I don't think we stay as long. Buying a condo that doesn't have a yard was probably the best decision for us, but it does make me a little sad that I don't have an excuse to buy mums. I love how bright they stay, long into the season. From the sounds coming from my kitchen, I think a pumpkin pie may be in my future! To me, the beginning of October is what I always think of as the beginning of fall Which just so happens to be my favorite time of year! Break out the warm, cozy sweaters, the thick wool socks, light some candles -- I'd gather around a fireplace if I had one! I love the apples, the cider and the doughnuts. I love the leaves turning, falling, crunching. Another great thing about fall is that it is the perfect time to break out the Halloween cross-stitching. I have three finished projects to show off. That sounds like a lot, until I confess that I finished these, one a year, for the past three years. The first one is the oldest one, "Trick or Treat," from Just Cross Stitch October 2008, designed by Lori Markovic of La-D-Da. Last year, I stitched "Ouch" by Angel Stichin. And finally, this year, in fact, just finished a few days ago, I stitched "Halloween Delusion" by Holly Gordon and Judy VonStein of Imaginating, Inc.
Of course, I can never just leave something alone, so I made color alterations to all three projects. I really like the green legs on "Trick or Treat." That large, solid block of purple in "Ouch" was made a lot more interesting by using Weeks Dye thread, although I ran out in the middle and had a terrible time trying to get more from the same store that I purchased the first batch from. It wasn't really anyone's fault; the shop owner was just ill and it took way more time than I had patience for. And of course, I had to completely change every color of pumpkin in "Halloween Delusion." I also had to shorten the tail a tiny bit, to allow for how closely I cut the fabric. But it was a really fun stitch, and I'm thinking of making it up as a pillow, perhaps. I have started another Halloween cross-stitch, but that is news for another day. Here's a picture of my cat. Just cause I feel like it. 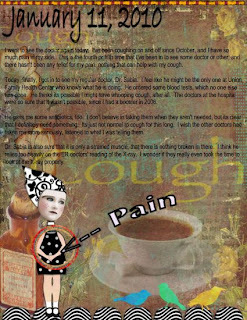 This is a digital art journal page I did today about yet another trip to the doctor for the coughing and pain. My last diagnosis was "cough." Today I get "chronic cough." Medicine is swell. I would never have guessed I have a cough. Neither would all of my neighbors. I haven't written much about it yet, but I am part of the Art Journal Caravan over at Scrapbookgraphics.com. I really like doing digital art pages. I am not physically able to do some of my favorite crafts right now; knitting is far too painful, and I need to heal. But at least I can spend my time doing something creative. Credits: Elfie Designs and Fiddlette Designs.